Procon Technology can supply the following electrical contact cleaners and conditioners from Caig laboratories in the USA. Please see price below and email us for quantity pricing. In Australia, call 03-98306288 now to buy! CLEANS ELECTRICAL CONTACTS AND LUBRICATES! Click here and Click here for a video on using DeOxit on guitar/amplifier equipment. Click here for more information on DeOxit and how to use it. Click here for DeOxit tips of the day! Caig DeOxit is mentioned in a number of FORD and HONDA service bulletins! So whether you're fixing a Tesla Coil (great for RF ground bolt connections) or a Tesla Electric Vehicle (EV)... try DeOxit. It has also been featured in various Automotive, Boating and Motorhome magazines! This FDA bulletin also mentions DeOxit - Click here - because it helps prevent "fretting corrosion" (contact failure) in critical health-care, hospital or medical equipment! DeOxit products * Maximizes System Performance in Severe Environments * Improves Conductivity * Maintains Optimum Signal Quality * Reduces Wear & Abrasion * Prevents Fretting/Dendrite Corrosion * Forms Protective Anti-tarnishing Coating * Stabilizes Connections Between Similar and Dissimilar Metals * Reduces Arcing, RFI & Intermittent Connections * Lubricates * For more technical information - Click here. You cannot possibly believe how good DeOxit and DeOxit Gold (formerly Pro-Gold) are at solving those intermittent contact problems that seem to plague almost all electrical products at some time - until you try it! Personally, I (Peter King) recommend these products myself because I know they work! I have fixed a mobile phone, a cordless phone, an electrical powerboard and an expensive Kenwood HiFi using the DeoxIT product (all within one week of first receiving the product). Problems which had plagued these products in my home and my office for years! My old contact cleaner just could not do what DeoxIT can. Please read my testimonial and many others below. You will find uses for DeoxIT in the home, in the office, in the factory, on motorbikes, cars and trucks, in boats and aircraft. In industries such as television and radio, telecommunications, security, medical and computer equipment, avionics, photography, audio and video. In fact, anywhere there is electrical or electronic products and possibly more (e.g. some people swear that it can be used on guitar strings). DeOxit is particularly good for battery contacts in digital cameras (Click here), mobile phones and any device used in outdoor or harsh "damp" or "humid" environments. Also helps prevent corrosion should batteries leak (e.g. alkaline batteries) and on car or truck battery terminals to prevent the formation of the white powder or ashy deposit. Also, we've discovered recently, DeOxit can be used on the metal surrounds to prevent further corrosion on connectors (such as D25) after being exposed to rat's urine... or other corrosive conditions! DeOxit can also be used for cleaning potentiometers and slide pots but is not recommended for cleaning keypads which use carbon based contacts... use DeOxit on the metal contacts only and then flush any residue with CT-CC350. Ideal for use on ALL electrical contacts including; battery contacts, mobile phone SIM cards, smart card contacts, computer connections (USB and other ports and inside on power terminals and PCB edge-connectors), memory cards and sticks (e.g. SD, SDHC, MicroSD, MiniSD, MMC, SmartMedia, xD, CF-I cards) and many, many other applications! Also great for use on vintage and antique radio devices and other equipment (computer, electrical and electronic) especially those using plug-in valves! Fantasic for removing oxide from Printed Circuit Boards (PCBs) and stopping oxidization of the copper! If you're having trouble soldering components on a PCB... try using Deoxit first! Personally, DeOxit is the product I reach for automatically when I suspect a contact problem or when I know a product is to be used in a 'harsh' environment! Outdoors, high humidity or industrial environments DeOxit is the answer! Use it BEFORE the problems start! Having noticed that the head of screws on desktop power supplies (when used in harsh or humid environments) seem to be the first to rust, I now use a small dab of DeOxit on the head of screws as a preventative measure (as a rust inhibitor). For general cleaning I use a large spray can of CONTACT CLEANER (CT-CC350). This is a precision electronic product cleaner that evaporates and leaves no residue. Great for flushing away dust and dirt from all sorts of things and is safe on most plastics! We recommend that DeOxit spray be used on hard-to-get-to components such as pots and switches and then flush any residue away with Contact Cleaner! Note, it's important to flush away excess DeOxit on any sensitive areas such as in audio circuits. Our recommendation is not to bother purchasing FaderLube but rather use DeOxit and flush with CT-CC350 or CRC-2016. DON'T PAY "$27.50" FOR "CO CONTACT CLEANER" BUY "CT-CC350" CONTACT CLEANER INSTEAD! Dual pack with one 7.4ml bottle (50mm high) of DeoxIT D100L-2DB and one 7.4ml bottle of DeoxIT Gold G100L-2DB. 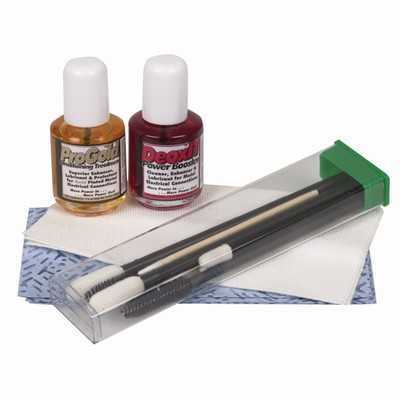 This kit is best for delicate equipment where the application must be applied precisely. Remember that all excess must be cleaned off delicate equipment! This is the best pack as it is less wasteful than the sprays and allows you to apply the DeOxit precisely. The bottles come with small brushes in the cap that allow you to apply DeOxit immediately or you can use the cotton buds or wipes supplied in this pack. To apply DeoxIT to sockets, apply it to the exposed pins of the plug first and then insert the plug into the socket! 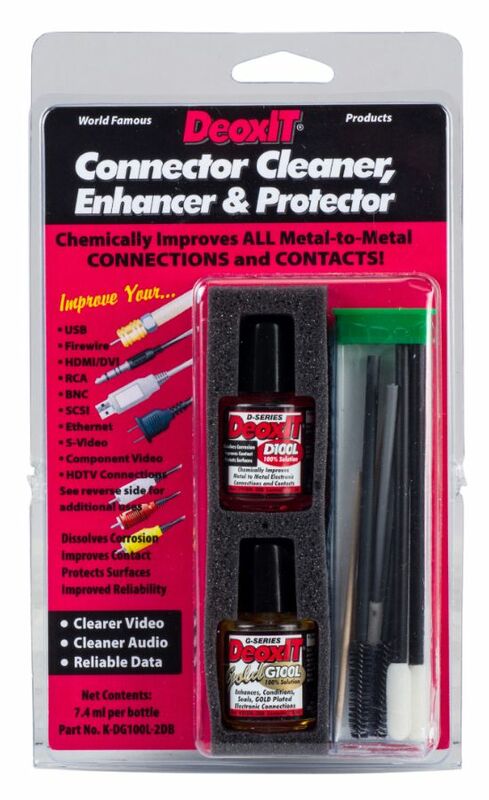 The DeOxit bottles look tiny (they easily fit into any toolbox or glovebox), but you only need to use a very small amount on the metal contacts only - unlike other contact cleaners that evaporate and can be used for general cleaning! The small DeOxit bottles will last a long time even when you use it continually on all devices as a preventive measure! ................for cleaning of PCBs, contacts, video heads etc. $20.00 $22.00 . MSDS: 'Material Safety Data Sheet' now available on request. Delivery charge within Australia $11 any quantity ($16.50 for EXPRESS BAG). Note, the CT-CC350 can only be delivered by road transport! Delivery to all overseas destinations P.O.A. - please ask. EX-GST purchases may only be made when the delivery address is outside of Australia. i.e. for EXPORT orders. Prices subject to change without notice. JustAnotherEngineer - I'm an electrical engineer and for over 30 years I have relied on Deoxit for cleaning, rejuvenating, lubricating and protecting electrical connections. It is very close to being magical - cleaning noisy switches, intermittent relays, and potentiometers (volume controls). Once applied, you will get many more years of additional service. Boeing Company - We have been using DeOxit products on switches, contacts and edge connectors and they are considered "Preferred Products" at Boeing. Bose Corporation - DeOxit is an excellent product for removing oxidation and contamination from dirty switches & controls and reducing intermittent contact problems. We have been using DeOxit products with great success for over 35 years. Hewlett Packard - Consistent intermittent connection failures on PC board edge connectors for our micro automation equipment have been eliminated by using DeoxIT�. It has been indispensable in reducing down-time on our equipment. Honeywell Inc. - DeOxit is great stuff. We use it on feedback slide-wires, edge connectors, & relay contacts in industrial process controls. News & Sound Studio Editors (Radio World) - The DeoxIT� Gold works great. I used it on some old tube equipment and it eliminated a loud hum that I thought was something more serious. DeoxIT� D-Series also got rid of the recurring contact noise in a rotary control that usually returned after using other sprays. Even works on keeping oxidation from metal panels and knobs. Rane Corporation - People call me daily asking for recommendations for cleaners and lubricants. Most everyone has tried something less than DeoxIT�, and after using what we authorize, the results are always positive, sometimes bordering on miraculous. Rane includes instructions for using DeOxit for maintenance in it's operator and instruction manuals for mixers, crossfaders etc. Tektronix - We use DeoxIT� Gold to protect virgin edge connectors, DeoxIT� D-Series contact cleaner to eliminate intermittent problems on primitive tin-to-tin connectors (which tend to vibrate) and will be using DeoxIT� Gold in the field for gold connectors . . . . . excellent product. Xerox - Corrosion problems on very sensitive connectors have been an annoying problem for us. We have tried many products without success until we tried DeoxIT� D-Series and DeoxIT� Gold. They are the only products that have worked perfectly. We highly recommend them. Other companies using* DeOxit... ABB, Agilent, Daktronics, Dolby Labs., Dover Elevator, Eastman Kodak, Federal Express, General Electric, Harman (Crown Audio equipment), Hollis (diving gear), Intel, Intermec, John Deere, Juergensen Marine (diving gear), Komatsu (trailer maintenance kits), Krohn-Hite, Logitech, McIntosh Labs, Motorola (pagers & battery maintenance), Nokia, Philips Healthcare, Roland, Switchcraft, Teledyn-CDL (subsea and diving equipment), Union Pacific, Wayne-Dresser and more! *or suggest using DeOxit in their manuals. OTHER USES: 1. Cleaning model train tracks and all connections with motorized models such as model racing cars, model aeroplanes, boats etc. 2. All electrical contacts/connections in construction sets such as lego, fischertechnik, mechano etc. Can also be used to preserve any metal parts from oxidation and stop those squeaky bearings on electric motors! 3. Can also be used as a rust inhibitor on new equipment... have you noticed that the heads of screws seem to be the first to rust? Coat them with DeOxit to prevent rust forming! I'd like to thank my previous supplier of contact cleaner because they closed their nearby store and forced me to look for another supplier. I couldn't find one that could supply the same cleaner which I'd been using for 20+ years, but my attention was drawn to a note in a catalogue saying 'Deoxit D5 Spray... A must have for service technicians'. So I bought a bottle and was amazed at the results! I had persistent problems with a number of devices in my office and in my home for years and had tried everything using the old cleaner... but Deoxit D5 changed all that! I first tried it on my mobile phone's battery terminals and charger connector as well as the SIM card contacts. All the problems I had with it disappeared including the 'no SIM card' message*. I then tried it on my cordless phone which was always playing up (not ringing or ringing when it shouldn't) by treating the cradle terminals and the AC adapter connector... problems solved. I also fixed an old power board with a 'dicky' switch... that's the great thing about DeoxIT - it acts as a lubricate as well! Can also be used to lubricate PCB edge connectors to make it easier to insert. I've also used it to lubricate power supply screw terminals and binding posts. i.e. it stops the squeaking! * There's another great thing about Deoxit... it can quickly show you where the problem lies! The SIM card problem kept returning so I pulled the mobile phone apart and cleaned out all the 'gunk' and applying DeOxit to all contacts and it hasn't played up since. My Nokia 3810 mobile worked for over 15 years and is still operational but no longer works on the 3G mobile network! Finally, I had problems with my expensive Kenwood HiFi system with scratchy volume control. Thinking it was the potentiometer I pulled the main unit apart and tried to clean the volume control but it was a digital! I put it back together again and the problem still persisted... finally after reading all the testimonials about DeOxit, I thought I'd simply spray the connectors at the rear of the unit which connected the main amplifier to the graphics equalizer, CD player and tape desk - Hey Presto - just like magic - the problem was gone! p.s. Because I would spray my old cleaner liberally (it evaporates away) it's taken me a while to learn to use only a small amount of DeOxit and to wipe away any excess. I found that it can cause problems on 'sensitive' analogue equipment! You can also flush DeOxit away using CRC 2016. I have also used DeOxit on a batch of gold plated Printed Circuit Boards (PCB) which we had difficulty soldering components due to poor wetting! UPDATE: since I treated my mobile phone with DeOxit Gold, it's been fantastic! I can even drop the mobile and it still continues to work, the battery now charges properly and lasts longer. After treating my Kenwood HiFi with DeOxit D5, the problem returned so I gave it the full treatment and left it overnight and then wiped it clean in the morning before treating it with DeOxit Gold (GN5) and so far it has been 'cured' too. I have also used DN5 on a brand new product that refused to work when the battery was inserted; I tried other batteries but still it didn't work. A quick dab of DN5 on the battery contacts and it started working immediately! Putting some DeOxit on USB contacts also solves many problems with 'unrecognized USB device' (I haven't had any problems with USB devices since). AN ACTUAL APPLICATION: Before using DeOxit on battery holders we use in one of our products, I measured the short-circuit current at 8 Amps. After applying DeOxit to a total of 14 contacts, the short-circuit current was 9 Amps immediately, illustrating how DeOxit reduces contact resistance on battery terminals. It's great for car battery terminals, digital cameras and other 'high-drain' or 'high-current' applications! It's just as useful for low current battery contacts where an invisible film or wax can inhibit current flows! I recently used it on the connectors inside a brand-new power supply that the manufacturer told me I'd have to re-calibrate. DeOxit saved the day and the power supply now works within specifications! WHY: Would you apply an enhancer or protectant on top of an oxidized/corroded surface? Would you apply gold plating over an oxidized copper based metal? Simple contact "cleaners" wash away dirt, dust, and grime, but prove ineffective at removing oxidation and surface sulfides. These tough contaminants actually attach to and become an integral part of the contact metal. This issue causes increased unnecessary service calls for covered warranty repairs that could have been prevented, translating into literally millions of dollars of lost revenue for service organizations. The only true method of eliminating oxidation and surface sulfides is by chemical action and reaction, and that's what puts CAIG DeOxit and DeOxit GOLD (ProGold) products in a class of their own. WHY: Why not improve performance, increase current flow, decrease heat and eliminate intermittents? DeOxit and DeOxit GOLD (ProGold) are designed to improve the flow of electricity between metal surfaces. These products are initially non-conductive liquids, when subjected to an electrical field, DeOxit and DeOxit GOLD (ProGold) promote current flow. No short circuits will occur. In both states, DeOxit and DeOxit GOLD (ProGold) have resistances high enough to prevent short circuits. I can testify to the effective of DeOxit in reducing contact resistance! On a battery pack, with an initial short-circuit current of 8A, I applied DeOxit to all contacts (14 in total) and the short-circuit current INCREASED to 9A. Also on a power supply terminal connection drawing 60 Amps, I applied DeOxit and HALVED the voltage drop! Remember a small 50mV drop across a connection drawing 60 Amps, means 3 Watts of power is dissipated - heat dissipation accelerates oxidation of your terminals! e.g. Try it on your car or truck battery which draws over 200 Amps when you start the engine. WHY: Once you have really cleaned a contact surface and enhanced its electrical properties, would you want to re-expose it to atmospheric contamination? i.e. humidity, salt, pollution, etc. DeOxit and DeOxit GOLD (ProGold) protect metal surfaces in two ways. First they mechanically bond, on a molecular level, to seal the metal surface. Second, the thin film moves as the contact is disturbed by vibration or another contact surface. In effect, the product(s) re-coat exposed surfaces. This is especially important on equipment subject to vibration. Greases, silicones, polymers and PPE's cannot reseal exposed surfaces. Once exposed or re-inserted they need to be re-applied. 4. CONCLUSION: When you want to do general cleaning and remove dust, dirt and grime, any contact cleaner will do. But when you need to cure contact related problems, and dramatically improve equipment performance, CHOOSE DeoxIT! NOTE: DeoxIT does not necessarily remove any superficial discoloration (black tarnish) caused by oxidation or burn-in (on vacuum tube pins). This will, in no way adversely affect the performance of the equipment. DeoxIT and DeoxIT GOLD (ProGold) improves conductivity irregardless of this discoloration.